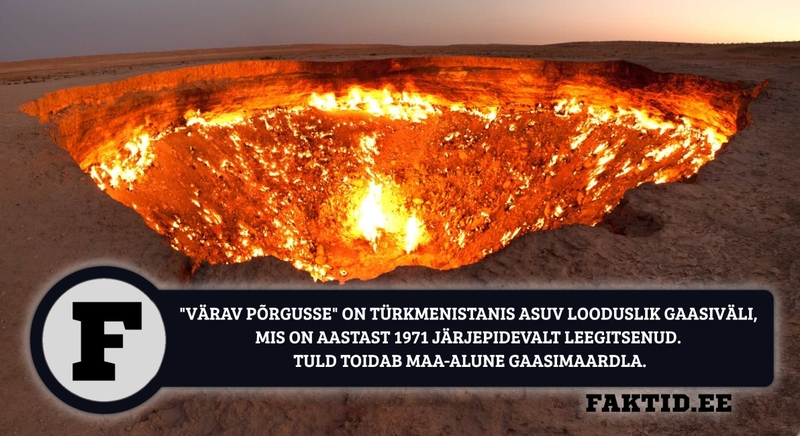 "VÄRAV PÕRGUSSE" ON TÜRKMENISTANIS ASUV LOODUSLIK GAASIVÄLI, MIS ON AASTAST 1971 JÄRJEPIDEVALT LEEGITSENUD. TULD TOIDAB MAA-ALUNE GAASIMAARDLA. “VÄRAV PÕRGUSSE” ON TÜRKMENISTANIS ASUV LOODUSLIK GAASIVÄLI, MIS ON AASTAST 1971 JÄRJEPIDEVALT LEEGITSENUD. TULD TOIDAB MAA-ALUNE GAASIMAARDLA.